Another thing is some issues with door markers I have encountered. I could have fixed them, now that I think of it. 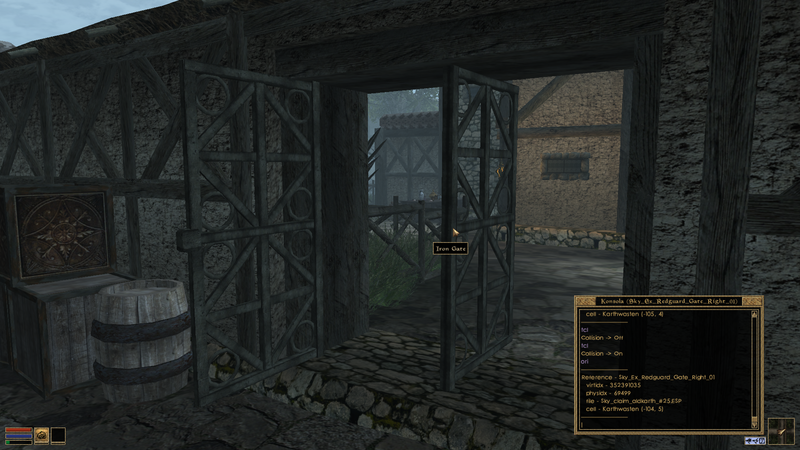 Door Markers in Karthwasten are too deeply sunk in their doors and you get stuck in them. There is an Altmer enchanter shop somewhere in the town, selling not just soulgems and enchanted items, but a bunch of random misc items. They should be assigned to a different owner, so they do not show up in the selling list. Also the Altmer seemed to be weirdly clothed for an enchanter, with extravagant pants and shirt instead of a robe. He walks around the house rather than staying behind the bar. He offered some items that were apparently meant to be enchanted, but the enchantment was missing, maybe wrongly cleaned out with TESAME? In the home of the retired imperial legion officer, one stair needs to be adjusted in position. The levelled items for some misc container still need to be changed in Skyrim-Data. 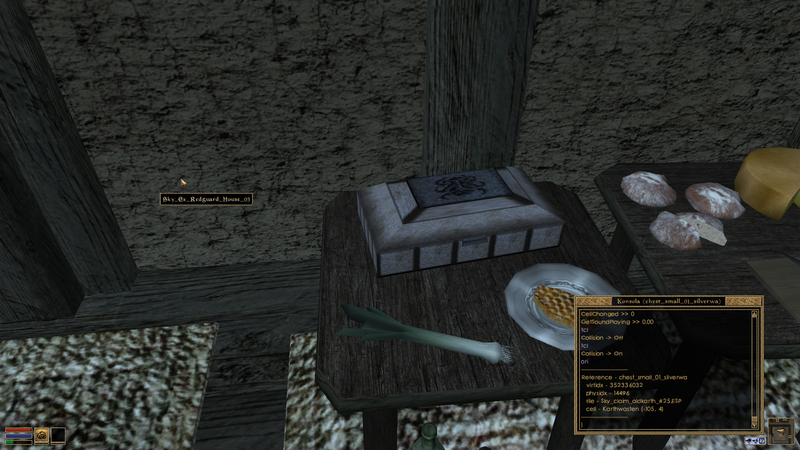 I found a 1000 gold worth nord silver dagger in a random barrel with misc objects. There is an int I built that when you enter the back door you can't get into the main shop because the bar static is blocking the door. It's a potion shop if I remember. Last edited by griff on Sun Oct 25, 2015 12:23 pm, edited 1 time in total. Since we do not have any clear responsibilities in our project currently, I stepped forth and downloaded all interiors from the claimed/reviewing/finished areas of the old forum. This also comprises the many finished interiors for scamps mesa and the one barrowcave by wolli that didn't get reworked yet. At the moment it should be difficult to assign some of these to their exterior places, as the designation maps for scamps mesa villages have been removed from this dropbox. We'll have to figure what is what by comparing them to their exteriors in the cs. There is one vampire cave in here that was meant to be used for that ambigious cave in the forest. I would like to repurpose it for a different place (haafinheim?) and add a forest barrow in its place. All in all this would mean that two barrows still need to be created for the forest, the bear clan family tomb and one more tomb. I think that should be doable. Also there is one more cave that came with the lowermost row of cells of my last exterior claim, which wasn't in the release file before. I guess, I should start to put up some interior claims for these all. I still have the map for Scamp's mesa claims, don't worry. Should we create threads for the non-finished interiors in the archive aswell? Roerich, can maybe try to sort out the situation with the underground caves below karthwasten and link the finished ones with each other? I'd say we should just put up all of them, reviewed or not. And maybe make a single claim for finishing the last bits in the non-finished parts. Yes, I'll see to that. As well as making palace #3 make sense. I have two papers I have to work on for uni soon, so I'll try and get some of it done in the next few weeks. It seems that I forgot to check back which claims were updated or completed on the new forum. Among the interiors in the unfinished-folder, karthwasten cave 11 has been updated by yeti on the new forum here. Cave_07 has been completed by Scamp here. Interior 01 (the palace) got reviewed by Luxray, but not shifted to finished here. Yeti reposted interior 03 here. Effectively only cave 09, claimed by RyanS, has never gotten to the new forum. A new claim should be made for it, because RyanS doesn't work on it anymore. The unfinished folder contains RyanS' latest wip file. I made a claim for cave 09 and moved the reviewed palace int. I don't know if Yeti is still working on the palace basement/direnni hallways claim. Yeti, if you want some more time for NPC'ing, I'm sure someone else could finish that int, adding a bit of the new Direnni pieces. I don't know how close it is to finished of course, and if you want to work on it yourself, it's perfectly fine. Thankyou for stepping in and taking care of all that stuff. Good to see I'm not alone in trying to get this mammoth behind ourselves. I'll finish my basement claim. Now that we have new Direnni pieces, it will be much easier to finish cluttering it up. Very good. 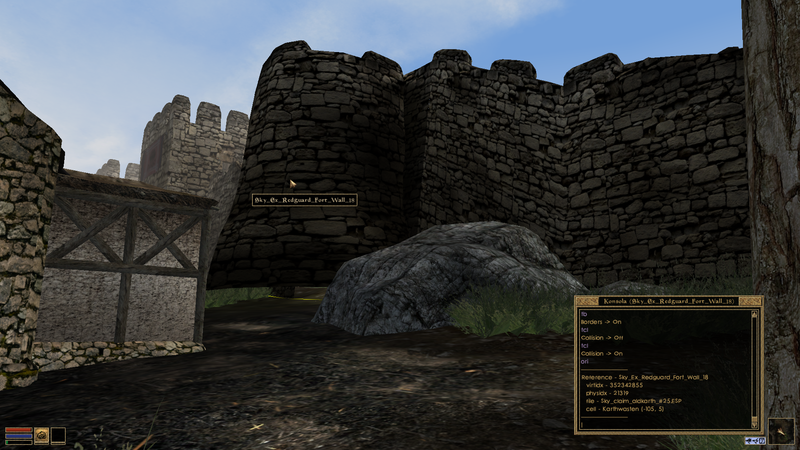 Seeing Karthwasten fully interiorized will be a milestone in itself! Reminds me. Would it be too premature to put up claims for the three farmhouse ints berry added by the dock? Yeti, I don't want to put an excessive pressure on you, but how is the state of things with Vorndgad Forest and Karthgad right now? It would be ideal, if we were able to work on #20 right after #25 and afterwards #19, #11 and #12. After these claims, our npced areas would be in a final, updated state and any further exterior work could happen in a painless way without interference with the npcing stage. Put them up. In the worst case, you'll have to delete or amend the claims. I've finished writing the bulk of Karthgad's new generic dialogue, but haven't gotten around to updating NPCs in the CS. Wouldn't it make sense to wait until exterior changes are made before commencing final NPC work? That way I can finish all the dialogue in a Google Doc while you guys work on the exterior. Yeti wrote: I've finished writing the bulk of Karthgad's new generic dialogue, but haven't gotten around to updating NPCs in the CS. Wouldn't it make sense to wait until exterior changes are made before commencing final NPC work? That way I can finish all the dialogue in a Google Doc while you guys work on the exterior. Even better. Then we'll work off Skyrim_Main_v01.esp for the Vorndgad Forest areas. Another thing: Is it possible to merge Skyrim_Main_v01 with the current Karthwasten file without trouble? We do have some intersection between these two in claim #20. 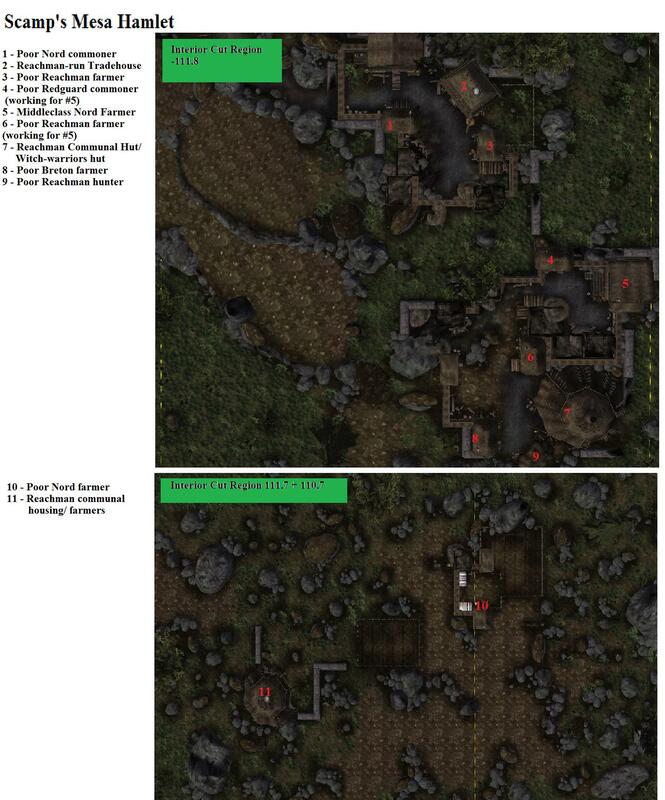 It would be good, if we could just extend the karthwasten-file with the forest area to base the forest claims on the finished cells in the Aldkarth Lowlands. Modders wouldn't be able to work on those areas concurrently, since they'd be merged into one file. That's the only problem I can see at the moment. I would like to do it, regardless (as soon as Berry has finished #25). It is much easier to orient ourselves on a single file, instead of switching forth and back. There is no concrete interest in working on quests right now and exterior work will have to happen consecutively, anyway. Merging transitive Aldkarth file with Skyrim_main is likely the most efficent way, if not the only one, to get done #20 claim, but I'm quite concerned about it. This file is already 9 mb huge, we should stay sure we can handle and mantain the quality level if it grows any larger. Hoota, The Reach topic wrote: It's a nice place to live, especially so close to the river. Retrieving water isn't so hard on my tired old back. For food, I mainly gather what I can from the forest and trade for meat with the hunters who come by every now and then. The city of Karthwasten is a ways to the south, though I haven't been there in years. Hoota, Karthgad topic wrote: It's a town somewhere around these parts. I can't quite remember where exactly. Sometimes its villagers come to me for healing, but not very often. Karthgad, latest rumors wrote: An elderly Redguard healer lives by the side of the Karth River close to the old stone bridge to the southwest. Look for her cabin if you find yourself injured or sick. With Karthwasten's mesa turning more cultivated now, and with the Karthwasten docks just across the river these entries are rather unfitting. How about moving Hoota's cottage somewhere else, e.g. someplace by the river in #20, where are hardly any points of interest right now? I suppose we could also rewrite a concept for this character to turn her into a less hermit-like figure, but that would be an unnecessary effort if you ask me, she is cool as she is. Some amends to the dialogues on direction to/from her cabin would still be needed either way. For quality assurance, I think it would indeed be best to install the systematic playtesting as suggested in the other thread. Other than that we are working through the exterior areas in dedicated claims that ensure that every spot is being looked at again at least once. By the way: I don't think anything speaks against fixing some of your discovered errors in your current exterior claim. I should have done that with my reported errors in my exterior claim, too, but was too narrowly interested in the landscaping aspect of my claim at that moment. I seem to recall there was a problem with a cliff mesh in Karthwasten not lining up properly. Hoota's dialogue will very likely be changed in my Super Vorndgad Forest Dialogue Overhaul Project.